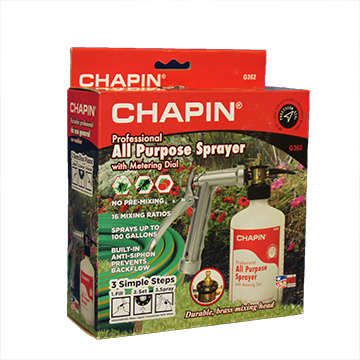 The Chapin professional all-purpose sprayer with metering dial combines ease of use with precise operation. It will spray commercially available liquid insecticide, fertilizer, or weed killer. This 16 oz. sprayer attaches to the hose and is designed to automatically blend the full strength of water weight liquid concentrate with water as you spray. Professional all-purpose sprayer with metering dial. Durable brass mixing head. For complete instructions and warnings see the information provided with the product. Pistol grip handle with lever valve for instant on/off operation. This should be fully opened when using the sprayer. Be sure the hold-open clip is off before connecting to the water supply. Mixing head including: Metering dial with settings for 1 through 7 or 10 tablespoons or teaspoons per gallon of water. Teaspoon orifice (converter) is stored in top of the mixing head. Unbreakable graduated pint polyethylene bottle with siphon tube and strainer. Adjustable deflector which can be turned to direct spray up or down and is removable for a solid stream which carries up to 30 feet for spraying trees. It is important that you flush out your sprayer after each use. This is to ensure trouble-free siphoning action and reduce any contamination between chemicals. Remove chemical from bottle and fill with clear water. Set the dial to number 10 and spray until bottle is empty. If the sprayer has not been cleaned, the next time you use it, it may not siphon properly. This means that some dried chemical has clogged one or more of the openings in the mixing head. If rinsing does not clear the openings, then a pointed object may need to be inserted to break through the dried chemical. Do this carefully in order to not damage the opening. If a weed killer has been sprayed, wash the bottle and the mixing head with soap and water and then follow the above procedure, but use 3 flushings. A second bottle is recommended for use with weed killers. Your sprayer has an approved anti-siphon device, which is built into the bottom of the handle. This products against any chemical from bottle being siphoned back into your water system. There may be a slight discharge of water through the two holes at the base of the handle when water pressure is turned on and off. This is a normal function of the anti-siphon device.